2. In a large bowl combine the broth, sugar, fish sauce, vinegar, cornstarch and paprika. Set aside. 3. In a hot wok or skillet add the oil, garlic and chiles. Stir fry over high heat until the garlic turns slightly golden, about 4 minutes. Add the broth mixture and stir until it boils and is reduced to about 1 1/4 cups, about 10 to 15 minutes. Keep warm. 4. Place the chicken wings in a 10×15 inch baking dish and bake, uncovered, in the preheated oven for 60 to 70 minutes (until browned and crisp). Turn occasionally. Drain off the fat. 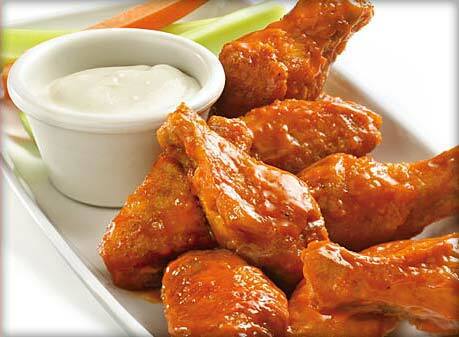 With a slotted spoon, transfer the wings to a platter and pour the garlic sauce mixture over them, mixing well. Garnish with red bell pepper strips if desired.